Welcome to Andover Historical’s research site devoted to Civil War era history related to the town of Andover, Massachusetts and its residents, businesses, organizations, and places. 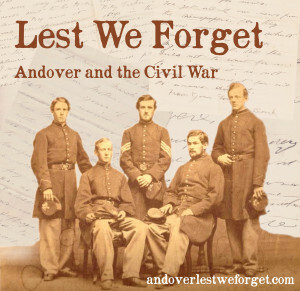 In Spring 2014, the Andover Historical Society, in cooperation with numerous community partners, was pleased to present a series of events commemorating the 150th Anniversary of the American Civil War. This website continues to provide resources for exploring the history of our town, its people, and their stories during this pivotal period of United States history. New resources, articles, and suggestions for content may be sent to info@andoverhistorical.org. Support for Lest We Forget was provided by The John S. and James L. Knight Foundation. Continuing support is provided by Massachusetts Cultural Council.